#stampinup #faithfulinkspirations #saleabration2017 I overlooked the "Avant Garden" set in the Sale-a-Bration catalog the first few times I flipped through it. I already have a bunch of floral sets, so this one didn't strike my fancy right away. All that changed when we used this set at our Proverbial Stampers gathering. I'll be showing you two ways to use this card today and tomorrow--and maybe a third way on Wednesday. We'll see how that goes. Today's card uses a color scheme that I haven't used in quite a while. I almost forget all the colors Stampin' Up carries. I tend to gravitate toward a certain bunch for a while and then move on to another bunch. Today's card uses Wisteria Wonder and Perfect Plum. 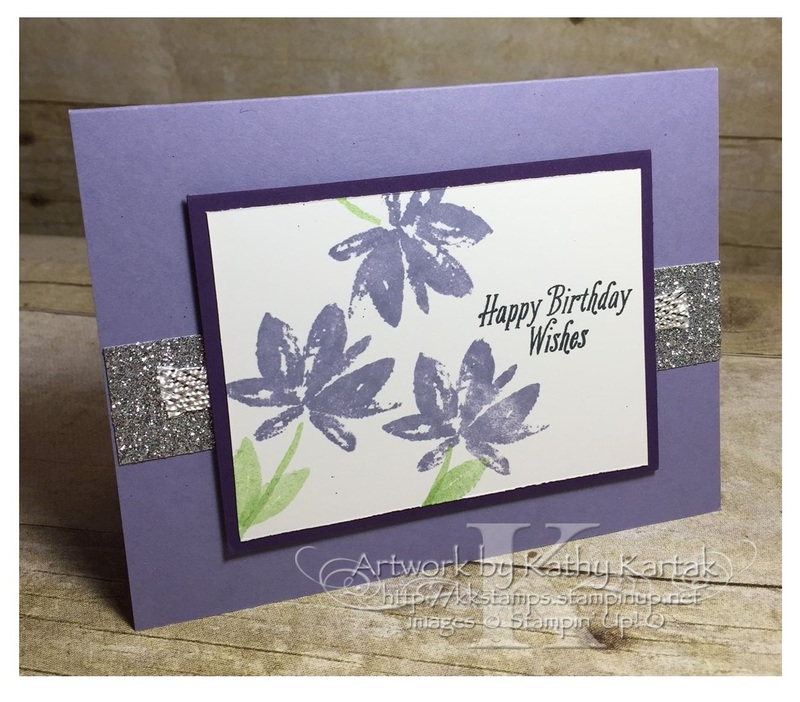 We started by stamping the flowers from "Avant Garden" in Wisteria Wonder Ink onto a 3-3/4" by 2-3/4" piece of Whisper White Card Stock. We added stems and leaves in Wild Wasabi--another color I haven't used in a while. The sentiment is stamped in Basic Black Archival ink. This piece is adhered to a 4" by 3" piece of Perfect Plum Card Stock. Next, we adhered a 1" strip of Silver Glimmer Paper to a Wisteria Wonder Card Stock card base and a 5" piece of Silver Metallic Ribbon--another item you can earn for free during Sale-a-Bration! We adhered the stamped element to the card with Stampin' Dimensionals. This is a quick and easy card--perfect for a spring time birthday! Remember, you can earn the "Avant Garden" stamp set or the Metallic Ribbon Combo Pack with a $50 purchase during Sale-a-Bration. You could earn BOTH with a $100 purchase! Contact me today!